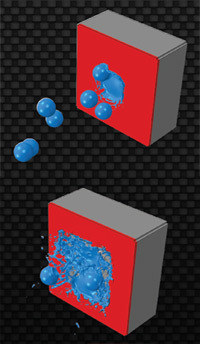 » Impact Simulation Materials Research & Design, Inc.
Materials Research & Design (MR&D) has developed state-of-the-art simulation techniques for various types of impact events. The foundation of these techniques is the development of custom material models that capture the unique response characteristics of metals and composite materials under the high strain rates associated with impact. Our physics-based constitutive models demonstrate strong correlation to tests while providing higher confidence in predictions than empirical models. 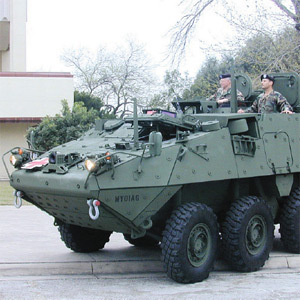 Under a Marine Corps Phase I SBIR, MR&D developed a nonlinear, hydrodynamic stress constitutive model that has been used to successfully analyze and design a vehicle armor system. Four armor designs were fabricated and, prior to testing, the model accurately predicted which designs would and would not defeat the threat. 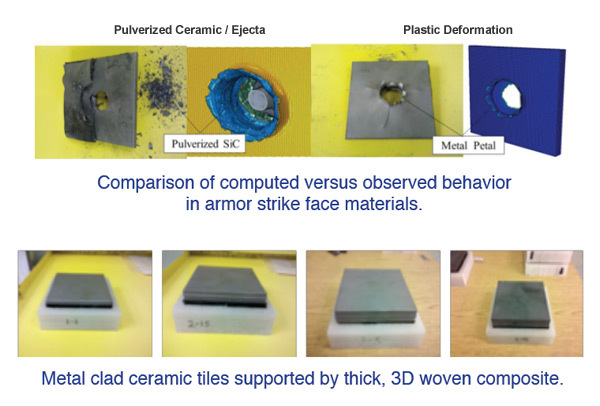 The model correctly simulated the response of the metallic-clad ceramic strike face including the pulverization of the ceramic and the plastic deformation of the metallic cladding. The model also correctly simulated the damage progression in the woven 3D composite backing plate including initial interlaminar failure followed by in plane fiber failure. The MR&D impact model provides an accurate and inexpensive tool for auditioning armor system designs prior to fabrication and testing. The push to improve fuel economy and performance of jet engines is driving operating temperatures to ever higher levels. As a result, CMCs are being utilized in more components within the engine as a result of their strength and ability to operate at high temperatures with no active cooling. MR&D is working with the Navy to develop a constitutive model that accurately captures the behavior and progressive failure of a CMC under impact from FOD. This customizable capability enables the evaluation of a range of advanced materials during impact and their subsequent residual strength. Whatever your material system, MR&D can help save time and money by auditioning candidate materials, fiber architectures and configurations before fabrication and testing. To address this shortcoming, MR&D has made significant investments in the development of dynamic impact models to assess material survivability of CMCs when subjected to potentially damaging water drop impact. The model addresses the pressure and strain rate dependent damage behavior of the CMC and coating materials. Additionally, the discretization of the raindrop can be defined using Smooth Particle Hydrodynamics (SPH) or coupled Eulerian-Lagranian (CEL) meshing techniques to overcome the large material deformations associated with highly nonlinear dynamic analyses. 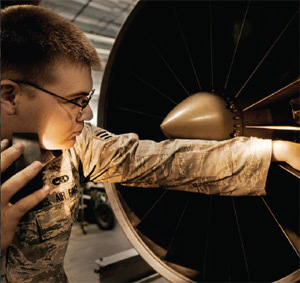 The model agrees with rain impact testing performed at WrightPatterson Air Force Base, in which impact speed and angle of attack were varied to impose different rates of material erosion.